Using a smartphone is an everyday task that comes easily to most. The typical user needs no instruction on how to send an email, request a taxi or stream a TV show, as navigating through various menus and apps is, for the most part, straightforward and intuitive. But for the millions of smartphone users with a physical, sensory or cognitive disability, operating a device can be a frustrating experience to say the least. As our world becomes increasingly more digital, and technology plays a bigger role in our lives, Samsung Electronics is working to develop various features that enable its products to be accessed and used to the greatest extent possible by all people. Let’s take a closer look at the company’s approach to do so in part three of our “Strides in Stewardship” series. Moon, who first got involved with Samsung through a company-sponsored computer education program for the visually impaired, now participates as a member of Samsung Supporters, a volunteer group that tests out smartphone features for usability and offers feedback to improve device accessibility. Most recently, he has helped to advance the Voice Assistant on the Galaxy S8 by determining which features cannot be activated using only voice commands. In addition to listening to external feedback from people like Moon who use Samsung products in their daily lives, the company has also established Smart Angels, a team of employees that voluntarily educates people with various disabilities on how to use their devices. The volunteers also listen to the opinions of the users to better understand how the company can further enhance accessibility. To reflect feedback received through these interactions, Samsung has developed and applied a variety of auxiliary technical solutions across the entire Galaxy lineup so that just about everyone can take advantage of its innovative products and features. For example, users with visual impairments can make use of high contrast fonts, keyboards and downloadable themes as well as a High Contrast Mode for the Samsung Internet app that all enable easier reading and higher visibility. Voice Assistant, meanwhile, provides spoken feedback about information on the screen, and Rapid Key Input reads out the keyboard character being touched, thus eliminating the need for additional accessories. Similarly, those with hearing impairments are able to utilize the Sound Detectors tool, which provides visual cues and vibration when the sound of a baby crying or a doorbell ringing is detected, and Flash Notification, which alerts the user of alarms and notifications with a flash of the camera light or screen. Easy Screen Turn On and Universal Switch features make the device easier to control through the use of gestures and/or movements, enhancing usability for those with mobility and dexterity impairments. These are just a few of the growing number of features Samsung has employed to make the daily task of using a smartphone easier and more enjoyable for all. In addition to UX and app enhancements, Samsung’s mobile services are also adding an element of convenience to everyday activities. Bixby Voice eliminates the need to go through multiple steps to accomplish a mobile task, allowing users, for instance, to dictate and send a text to a friend or check their daily schedule with a simple voice command. Likewise, Bixby Voice makes it possible to quickly engage with friends, family and other communities on social media and in text messaging applications. Bixby Vision also makes life easier by using the phone’s camera app to relay information about one’s surroundings. To illustrate, it can vocalize which food items are in front of a user so they can know that they’re opening the specific potato chips or soft drink they want to consume. Another example is Samsung DeX. While the service enhances the mobile experience by allowing users to use their smartphone like a desktop by providing a seamless, secure mobile to PC transition, it also enables those who experience difficulties typing or using gestures on a smartphone to more easily navigate content via a larger display. 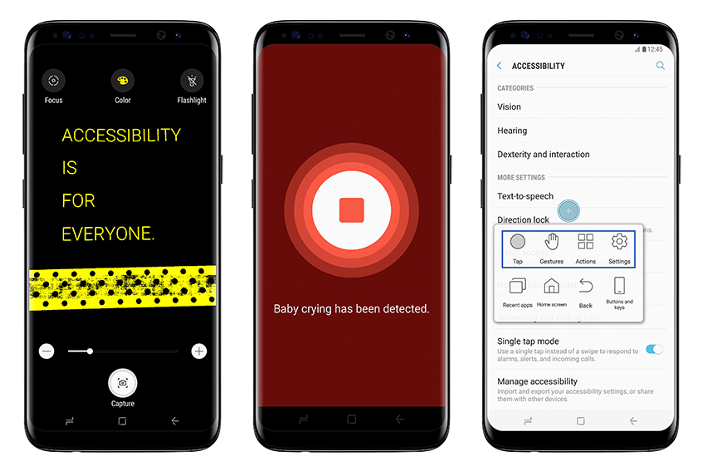 Samsung’s efforts to enhance accessibility have recently been praised by various organizations including ONCE, the National Organization of the Blind in Spain, who recognized the Galaxy S8 and S8+ as devices that comply with the universal accessibility requirements and are properly equipped for visually impaired users. Additionally, the National Human Rights Commission of Korea will present Inho Baek, Samsung’s Mobile Accessibility UX Designer, with the Human Rights Award of Korea on December 8. Baek is honored to have been nominated for such an accolade, but admits that he is more excited to learn of the many ways Samsung’s products have and will continue to influence users’ lives.